In one week I will be sending my son Leyton off to kindergarten. I know I will still be a wreck even though he did go to 4k last year which was for 1/2 day 5x a week. There's just something about him now going a full day that is so hard to take in. Perhaps because for the next 13+ years he will be doing the same thing. I've been so lucky to be able to be home during the week for a great majority of his life. My daughter Maddie will be attending 3 year old preschool on Tuesdays and Thursdays for 2-1/2 hrs. That is also crazy to think about! She is ready for that and asks almost every day if she can go to school yet. Is that a girl thing? 1. Dabbawalla back packs - isn't this adorable? 2. Nix Baby socks - love the bright colors. 5. 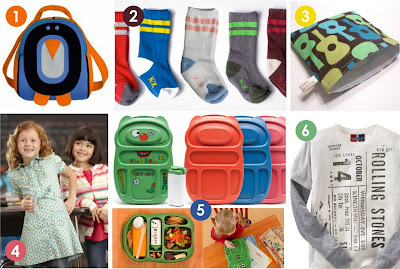 Goodbyns lunch boxes - you gotta check these out. They are not only adorable but, are a green product. Even the stickers used to decorate them are printed with vegetable based inks.